An integrative spiritual practice weaving the art of surya namaskara yoga (sun salutations) with medicinal music, qigong, meditation, and prayer. In this practice we learn to embody the radiant presence of the divine sun, as well as harmonize our beings with earth, nature, and cosmos. 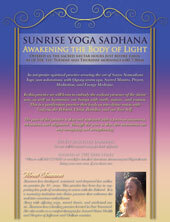 This is a purification practice that supports us in awakening into union with our true Self. The focus of the practice is on breath, awareness, energy work, and alignment. Though the pace is slow (in comparison with some practices), the movements are very energizing and strengthening. Please refer to Calendar for current dates, times, and locations.